McDonald’s 2015 Coca-Cola Glasses Plus A Giveaway! I'm excited to share with you the good news from McDonald's! Once again, two of the world’s most loved companies go hand-in-hand to serve more smiles and everyday happiness to customers through the 2015 Coca-Cola Glass Collection. 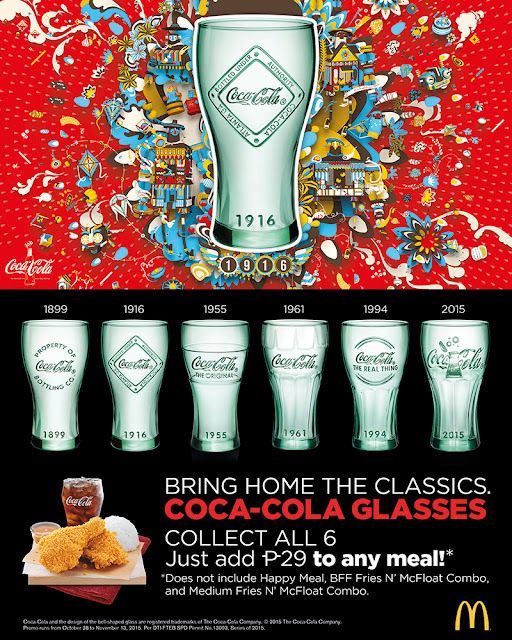 If you're a glass collector or a Coca-Cola afficionado, you could start collecting the 2015 Coca-Cola Glasses, available in all McDonald’s restaurants nationwide which started last October 30. How to get it? It' simple! You just have to add Php29 to any McDonald’s meal! 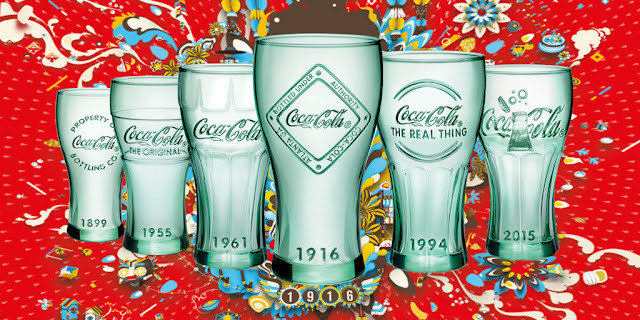 There are a total of ix designs to collect, each is embossed with the Coca-Cola logo and is date-stamped, representing the imagery and advertising of the following periods—1899, 1916, 1955, 1961, 1994, and 2015. All glasses take the shape of the iconic contour bottle and are offered in the Coca-Cola bottle’s original Georgia green color. Collect all six designs only at McDonald’s via Dine-In, Drive-Thru, or McDelivery via 86-2-86, www.mcdelivery.com.ph, or the McDo PH app, all day, including breakfast hours. Share your collection at McDonald’s official Facebook page, www.facebook.com/mcdo.ph, or by tagging @McDo_PH on Twitter and Instagram. Now, here's the EXCITING GIVEAWAY!!!! "What's your favorite McDonald's treat to pair with a refreshing glass of Coca-Cola?" Winners will be announced on my BIRTHDAY, November 16! If you're one of the two lucky winners, please expect a message for me to ask for your details. McDonald's will send the GCs to you! My family's favorite McDo treats are Chicken McNuggets, Crispy Chicken Fillet, Chicken Fillet Ala King and of course Chicken Mcdo! Pair it with a refreshing glass of Coca-Cola - PERFECT! Plus my daughter won't go home without Mcdonald Kiddie Meal! One of my favourite McDonald's treat to pair with a refreshing glass of Coca-Cola is the McChicken sandwich, the chicken fillet is so juicy and the vegetables are so fresh and crisp! I always buy this when i want to have a power lunch but enjoy eating a very delicious complete meal as well, and what is a complete meal without the refreshing taste of coca cola to go with it? Now that's what i call a full and scrumptious meal! My favorite McDonald's treat to pair with a refreshing glass of Coca-Cola is Chicken McDo and McSpaghetti a la carte.Hmmm, looks like I'm craving it for now. A refreshing glass of Coca Cola is best paired with my all time favorite - the Chicken Fillet / Chicken Mcdo! Not only it quenches my thirst while I devour those crispy chicken but as well as boost up my energy level and happiness! Also, Coca Cola can also match my favorite fries in the world - the McDonald fries! My favorite pair is eggdesal plus iced mocha! <3 superb! Big Mac with Large fries to pair with a glass of coca cola is the perfect combination! What's your favorite McDonald's treat to pair with a refreshing glass of Coca-Cola? My favorite McDonald's treat is Chicken Nuggets meal with french fries. This meal treat is great paired with a refreshing glass of Coca-Cola. It is a complete meal that made me full. I am enjoying it and I can eat it and drink Coca-Cola everyday. My favorite McDonald's treat to pair with a refreshing glass of Coca-cola is the Double-Cheese Burger Meal. It is my favorite since then. My day is complete munching double cheese burger with fries and it really made me feel satisfied because I have a iced cool refreshing glass of Coca-Cola, a great combination that you will always looking forward to eat and drink everyday. Omg omg omg!!!!!! Thank you so so much!!!!! I am sooo happy!! I can't wait to collect all the coca cola glasses and eat some chicken!